My first ever job was in a restaurant and wedding venue called The Cottage Lodge in Cheshire, working on weddings and in the restaurant on a Sunday. That was my first official job, before that I had several stints as a car washer in the village and at age 8 a friend and I tried to set up a pet hotel – it didn’t really take off. I have had an interesting journey to where am I now, and have travelled far and wide to finally settle in London. 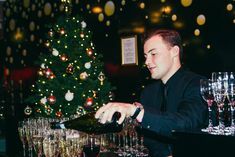 During University I worked at a live music restaurant called The Knutsford Wine Bar, and on leaving university I became general manager. I was singing in my own covers band at the time, so the two jobs really went hand in hand. If I wasn’t booking a band or organizing a wedding, I was singing at one in my band! I had itchy feet for travelling though, and after spending 4 months in LA learning the art of screenwriting in 2012 I decided to take the plunge and move to Mallorca where I started working on luxury yachts. This took me all over the Mediterranean and Caribbean. After backpacking though South America, I moved to London, and landed my job here at Merlin events! My dream job would be to plan destination weddings with a twist, preferably for clients who want something a little different! I love the events that party planner Fiona Leahy creates, such as the gothic wedding she created for Marilyn Manson and Dita Von Teese. That would be great fun and I love the creative side to events, so this type of event planning would be right up my street. My days really vary, which is what I love about Merlin Events. 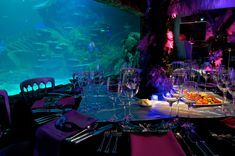 When I am not in our lovely office in Madame Tussauds planning events and answering the phones, I could be spending the morning showing a client around the London Dungeon or be over at the SEA LIFE London Aquarium in the afternoon setting up an event. I love the variety our venues bring; each and every event is so unique. Tell us about your most interesting experience at work to date. That has to be sailing around the wold working on board luxury yachts. This involved organizing the lives of the guests whilst they were on board, and could include everything from booking restaurants on remote islands, liaising with the chef daily to create bespoke menus for each meal, and creating beautiful flower arrangements throughout the interior. On one large motor yacht that I worked on, I did all the creative design, which involved creating and refreshing over 20 flower arrangements daily! We would get flower deliveries from every port we got to, and keeping them innovative and looking great in the air conditioning was quite a challenge, which I loved! Working on boats every day was varied and a real challenge but very rewarding, with days off being very infrequent but when they did come they were worth it, and in the summers they could be spent clubbing in Ibiza, and in the winters at the beach in Antigua! I write a blog, www.mytraveltrove.com, and I am also writing a novel. I love being in London and try to do and see as much as possible, so on the weekends I like to go to pop-up restaurants and art galleries, and try as many new cocktails as possible!